Before Green Gables is the highly publicized, much anticipated, authorized prequel to the book, Anne of Green Gables. It was written by Budge Wilson, published in 2008 and read by me right away, that summer. Anne of Green Gables intrigues me because I grew up with Anne. I read the books, enjoyed the television series and have seen the musical on Prince Edward Island twice. I would love one day to return. When I grew up, Anne's home was only a couple of hours away from mine although when I lived in Nova Scotia, you had to take the ferry to get to the Island. If you love Anne of Green Gables, you are going to love Before Green Gables. Before Green Gables was released during the 100th anniversary of Lucy Maud Montgomery's book, Anne of Green Gables. The prequel was somewhat controversial because it was written by a modern day author. However, if you have ever wondered what Anne's life might have been like before she went to Prince Edward Island, you will enjoy this book. The original book only hinted at what Anne's life might have been like and Wilson tells it as she sees it and she does a good job of doing so. I discovered this short Youtube video, which talks briefly about the book including why and how it was published and author Budge Wilson's initial reluctance to write about such a beloved character, a world renowned Canadian icon. The video also introduces the book Imagining Anne: The Island scrapbooks of L.M. Montgomery by Elizabeth Epperley a book that I have yet to read but which sounds interesting. Anne of Green Gables and the stories that included her are extremely well loved around the world. Fans have been reading about her adventures in Prince Edward Island for more than a hundred years but until now we've not known how Anne Shirley came to be in Avonlea. For those who have read Anne of Green Gables, it answers questions. For those who have not read the books by L.M. Montgomery, it is a good story and introduction to Canada's most famous redhead. I can guarantee that once you have read this book you will want to read Anne of Green Gables. Budge Wilson is the author of Before Green Gables of course but before she wrote this story, she was already a well-known Canadian author. She's a Nova Scotian and she has more than 30 books to her name. For those books, she has received 25 awards that include but are not limited to a number of Canadian Children's Book Centre "Our Choice" awards, a first in a CBC Literary Competition, a City of Dartmouth Book Award, a Canadian Library Association Young Adult Book Award and more. Yes, YES, yes. I definitely would. 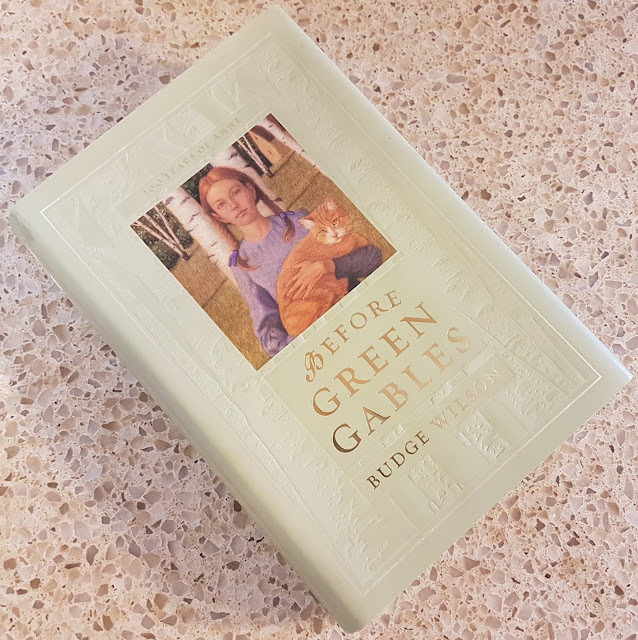 It is an easy read that harkens back to a simpler time but more importantly that ties into a very important children's book, Anne of Green Gables. A reviewer at the Washington Post said, "The back story we knew just in passing takes on a rich, real life of its own full of credible period detail. I was rapt." I agree and I was rapt, too. 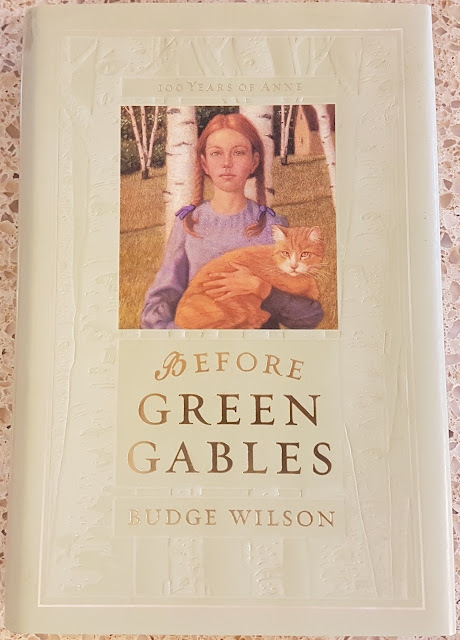 Fans won't want to miss Before Green Gables to find out what Budge Wilson imagined as Anne's life before P.E.I. The estate of L.M. Montgomery, who commissioned this book, approved, too. Are you a fan of Anne of Green Gables? Have you read this book? If so, what did you think of it? You can learn more about or order your copy of Before Green Gables on Amazon by clicking right here. If you are a fan of Anne, you might like to check out the other book that depicts Anne's life before Green Gables. Canadian fans of Anne of Green Gables were delighted to find her on one of Canada Post's postage stamps in 2008.
Who Was Lucy Maud Montgomery? Canadian author Lucy Maud Montgomery (1874-1942) created Anne of Green Gables from her vivid imagination and Anne's story was first published and presented to the world in 1908. Learn more about the author here. Brenda, as I read your reviews related to Anne of Green Gables, I am convinced you are probably her biggest fan of all time. :) This "Before" book sounds like another wonderful read related to Anne of Green Gables. Thanks for your interesting review. I love Anne of Green Gables and would have been hesitant to read an newer installment if you had not recommended it so highly. I always worry that a more current day author would take away from the old fashioned authenticity of the original book. Thank you for the recommendation Brenda! I'll have to plan to read these books (finally) - I haven't read either, and of course, I should have by now. I am going to add these to my reading list. Your recommendation has me hooked. I would enjoy reading this prequel. Thank you for introducing me to it. As Wednesday Elf stated, Brenda, you indeed must be Anne of Green Gable's biggest fan! This is another excellent review from someone who definitely knows her subject. Like Barbara, I'm just going to have to read these books once and for all. I loved the Anne of Green Gables books and do want to read this one. I just can't afford it yet. Great review. Thanks ladies. I'm not sure I qualify as AOGG's largest fan but it is a subject close to my heart.